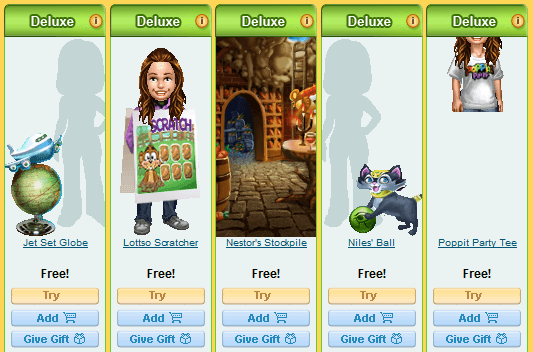 New items are available in the Mini Mall today. All of the items in this release, including the animated ones, are completely free. Note: this is one of the last two Mini Mall releases. The final one will be St. Paddy’s Day (March 7). After that there will be no new content or re-releases added to the Mini Mall as Pogo focuses on other parts of the site. I noticed there is no retirement date on anything. I guess this is what they are going to stock the Mini Mall with for eternity. Since it was all free, I got them all. But I normally wouldn`t have gotten too much. There was only about 1 gems things, I would of gotten. I was wondering why they didn’t add anything for Valentine’s Day. They wouldn’t have been new, but new members and others would have gotten them. The Valentine items are still available for another 8 days. They were removed from the New Releases tab, but can’t be found in the individual categories. I’m glad my closet is fairly robust – I already miss good mini releases! This is one of the nicest releases since Pogo stopped caring about minis and since the mini mall’s debacle . I like it because most of the items are so very nice and cute! The Cookie Connect “characters” are adorable and Nestor bouncing on the lottso ball is adorable too and I love the Cape Cod animated background, it is very nice, oh! and the Stack’em mad cow ready to explode cracks me up! Maybe not what many were waiting for but at least most items are new and not rereleases or recolored. Is the first time in a very very long time that I have mostly “Try” buttons instead of only “Put on” buttons lol. And of course I’m glad all is free or I should have passed on all the adorable animated items otherwise. nessa, I completely agree with you — I think it is a great release from Pogo, and how can anyone complain about the items — they are all FREE! I think the little “characters” are so cute and adorable, and I especially like the bouncy ball Nestor is on, and the seagulls — they will go great with my seaside backgrounds! Thank you Pogo for this nice release, and for making them all free to us! they said no new items will be added..will the older items keep getting release? does anybody know? all they have to do is hit a few buttons to re release older items. I wonder if all the free items that would be gems were given to us because Pogo knows we’re unhappy about the dying mini mall? I did get most of the items this time and agree w/others that I wouldn’t have spent gems on anything in this release. I don’t know if non-club members get all the free stuff? but I think I’ve decided to let my club membership lapse. It’s a hard choice because I started Pogo in 2001. Club had been worth it to avoid ads, have marathons, get badges and such – I have other options for entertainment that have less frustration and never feel “pressured” to get something done. As always, thanks to Lura, Badge Hungry and Big Fish for many great offerings! Well I’m sorry but I love the new mini releases. I had some disturbing news today and when I came home & saw these, they put a smile on my face. I’ve been with Pogo for a while & have plenty of stuff to use this new release. Thank you. will we just see all the items we Bought in the mall its self ????? what? no more mini items? what is pogo thinking to take away tokens and now this? Pogo won’t need to re-release items after March 7 if they make everything that can be re-released available for sale in the mini mall indefinitely on the March 7 release! Will the animated mini items continue to work after Flash goes away? Doesn’t Pogo want to sell the existing gem items while it still works? The last part of Pogo’s statement on the Jan 29 blog: “Your wardrobe of Mini items will remain available to you, along with tons of items in the store.” would only be true for members who haven’t bought everything that is currently available. I never understood why Pogo would give up potential sales by placing things in a “vault”! The mini mall is a virtual store filled with virtual items that should not be limited by real world parameters other than price!